Love the color it's just what it looks like online. It's a bit thinner than I was expecting but was more what I was looking for not being super thick. 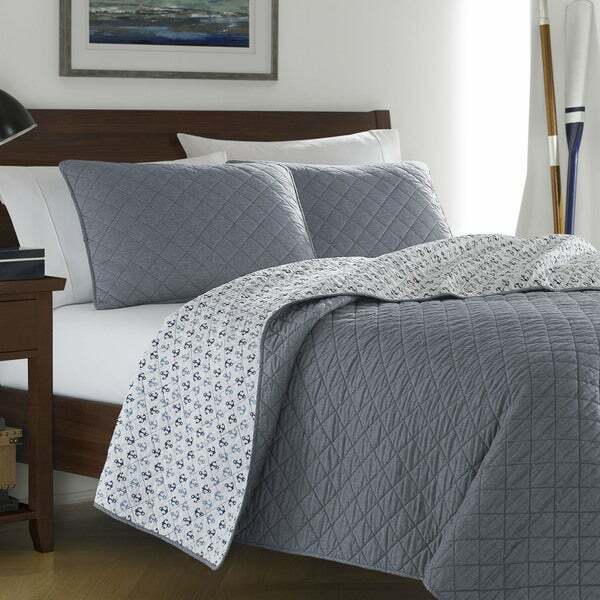 Poppy & Fritz Finn quilt set basic blues are smart and classic. This pre-washed cotton denim blue quilt has the casual, relaxed look of your favorite weekend wear with the novel addition of a nautical foulard anchor print on the reverse. Machine Washable. This quilt set looks great in my guest room of our new beach house! It is a timeless coastal style without looking cutesy or childish. The shams are a dark denim and this set looks great on my white queen bed! This quilt is perfect for our son's nautical themed room. The fabric is soft and of great quality. We searched many places to find a quilt that was inexpensive but did not lose quality. This is the quilt!!! "What is the fill? Are both side cotton? I'll be using anchor dude more. Shabbat to make dure durable. Thank you for your response in advance. J.R. in Dallas "